Welcome to yet another edition of Woof Wednesday. Today I’ll be featuring Jacob the cat who is being fostered at my niece Tressa’s house and is up for adoption if anyone in the Chicagoland area would like to supply a good and loving home for him. Jacob is such a beautiful cat! I remember talking to my niece’s husband Jon this past Christmas about what a sweet cat he is. Just look at those eyes! This is Jacob, a cat we are fostering from humane haven animal shelter in Bolingbrook. 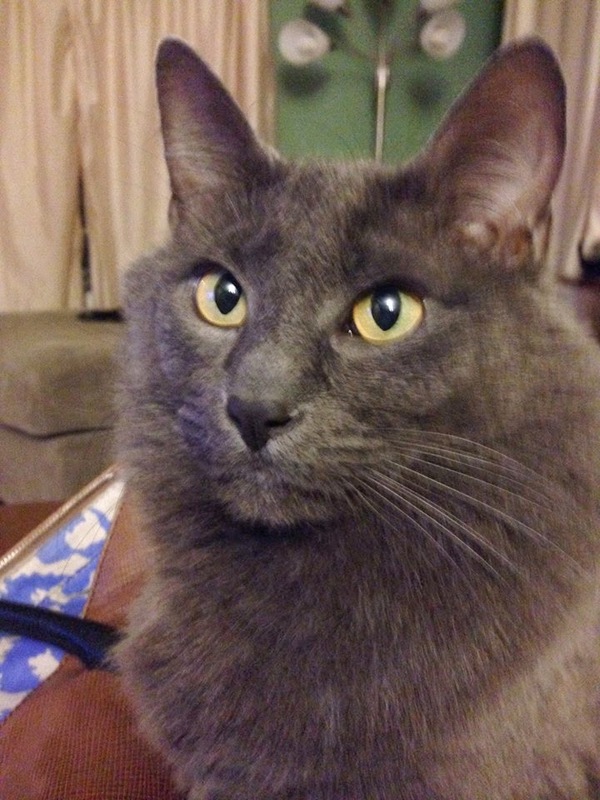 He loves to cuddle and snuggle, and he is quite handsome with his soft solid gray fur. He will climb on laps, shoulders, pillows and anything else you can think of to get as close as he can to his people. He is available for adoption if anyone in your network knows of a good home! Thank you so much for sharing Jacob with us, Tressa. I hope that through this posting, Jacob will find his forever home. In the meantime, you’re doing a wonderful thing by taking such good care of him in your home. If you’d like your pet featured on an upcoming edition of Woof Wednesday – Pet Friends, I’d love to show them off for you to my readers. Just email me a photo (or more) of your pet (dog, cat, bird, lizard, fish, etc.) along with a little bit about what makes them so special to you, and I’ll take it from there. Then, each Wednesday, I’ll feature a new pet/pets from you, my valued readers. Because I’d like this blog to be as interactive as possible, what’s better than sharing the pets that make us smile and fill our hearts with love? Kudos Kitchen by Renée ~ Where food, art, fun (and fur) collide on a regular basis! What a handsome guy Jacob is. How wonderful to have such a loving foster family.